Are we witnessing a comeback from traditional high street retailer HMV? Recent figures suggest so, with announcements highlighting stronger sales and consumer perception. There was much consternation from the public when it was announced that HMV had been placed into administration, leading to the closure of a number of stores following competition from online retailers such as Amazon. Since that all time low, the brand has tried to rebuild, and the latest news suggest they have been making gains, specifically from supermarkets. The company has looked to re-focus on its core music and film offering as well as re-thinking their store layouts and marketing initiatives. It now places emphasis on live gigs and record signings, as well as highlighting its Pure HMV loyalty programme. Crucially, it has tried to rebuild relationships with record labels and film studios. What then, does YouGov’s BrandIndex data suggest has been going right for the retailer? In almost all of our key metrics, we have seen a gradual improvement, characterised by a good degree of consistency, a contrast to the tumultuous time HMV experienced previously. YouGov’s Index rating includes a variety of metrics, including quality, reputation, impression and value. We see that HMV’s index rating is very healthy 10.6. YouGov’s Buzz metric shows that the brand still has room for improvement. The measure shows whether a respondent has heard anything negative or positive about the brand in the past two weeks. 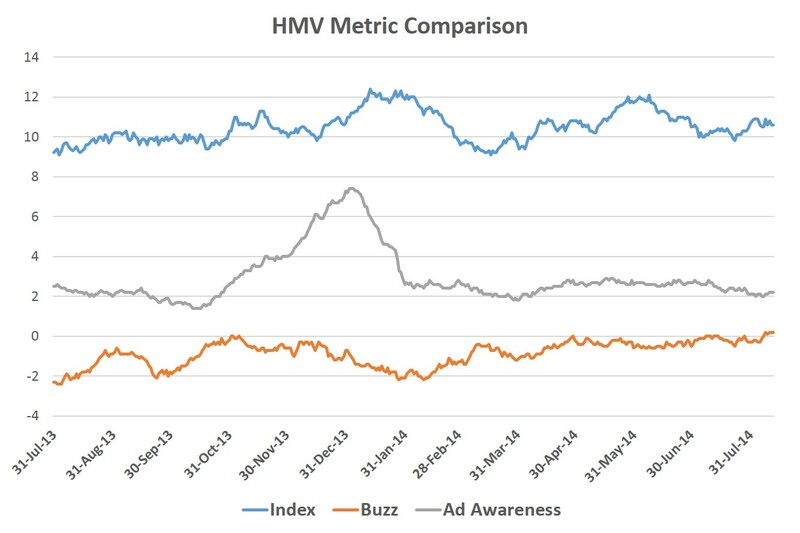 In this case we find HMV still has only very recently gained a positive rating, currently standing at +0.2. This is an improvement from -2.4 at this time last year. More good news is that HMV did appear at 3rd on our mid-year list of top buzz improvers in June. There was a large spike in YouGov’s ad awareness metric from September until December last year, obviously coinciding with the desire to cash in on the Christmas bounce. Looking beyond this though, it shows that HMV felt they were in a strong enough position to commit once again to a high profile campaign. Its future forays into the advertising market will be key for their re-development. There are questions still outstanding however; how sustainable is this recovery? Does the brand need to use it stores as a means of encouraging a far greater proportion of e-commerce income? And how will HMV try to out-manoeuvre its rivals in the months ahead?